Dimensions 117'6" x 93'11" x 27'6"
Variants The C-54B had integral wing tanks and provisions for stretchers. The C-54D had R-2000-11 engines. The C-54E increased the fuel capacity. The C-54G had 1450 hp R-2000-9 engines. 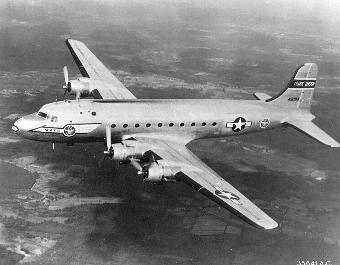 The C-54 was a slimmed down and simplified DC-4 taken over by the U.S. military. It could carry up to 50 passengers, though the unpressurized cabin must have made for an unpleasant trip. It had a strong floor and large freight door, 44 removable seats, and provisions for towing gliders. Large flaps and a tricycle gear made it possible to operate this aircraft off of ordinary military runways. The DC-4 was first prototyped as a 52-seat pressurized commercial passenger aircraft, but it was judged too large and expensive for the market. The aircraft was redesigned as the 42-seat unpressurized DC-4A, of which 24 were in production for civilian airlines when war broke out. The Air Force commandeered the production line and the first units, which went into service unchanged from the commercial configuration. The aircraft proved extremely reliable in operation, with just 3 aircraft lost in 80,000 ocean crossings. About 23 went to the British, and Churchill used one as his official transport. The U.S. Navy designated it the R5D. About 30% of C-54 crews were deployed against Japan.